Janice Sielaff had a few important goals in mind when scheduling her knee surgery earlier this year. The 57-year-old works part time as a clinical lab instructor for Lincoln Community High School’s LTEC Health Occupations program, which she initially started back in the early 1990s. She also volunteers as the discus and shot put coach for the high school girls’ track and field team. Plus, she’s preparing for an empty nest. 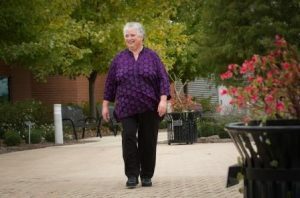 When simple movements became excruciating, and she couldn’t help at track meets last spring, Janice knew it was time to do something more comprehensive than the knee injections that provided only temporary relief. She talked with orthopedic surgeon Tomasz Borowiecki, MD, about the Memorial JointWorks program at Abraham Lincoln Memorial Hospital. Dr. Borowiecki had made minor cartilage repairs to her knee and replaced both knees for her husband, Don. Thanks to Don’s successful joint replacement surgeries and the presurgery class and consultation with the ALMH JointWorks coordinator, Janice knew what to expect. After surgery, she was up and walking within a day. Janice could tell a difference immediately. She went home using a walker and advanced to a cane after starting physical therapy. Today, she walks comfortably which has made a huge difference in her busy schedule. Her advice if you’re considering joint replacement? The innovative Memorial JointWorks program includes orthopedic surgeons, anesthesiologists, nurses, therapists and social workers who guide patients from presurgery education through postsurgery rehabilitation. JointWorks is available at Memorial Medical Center in Springfield, Abraham Lincoln Memorial Hospital in Lincoln, Passavant Area Hospital in Jacksonville and Taylorville Memorial Hospital. For more information, visit JointWorksMemorial.com.